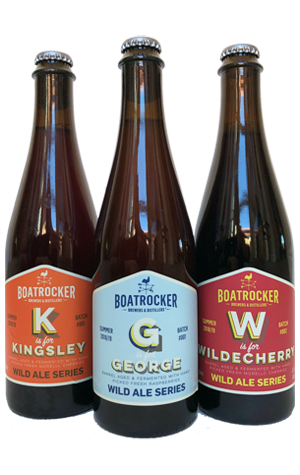 Boatrocker co-founder Matt Houghton has doffed his cap to family members in the past and is at it again with a duo that forms part of three Australian wild ales released at the same time. The family member this time around is grandfather George Kingsley Sutton, who the labels tell us was variously an archaeologist, art collector, gastronomist and patron of the arts. The beers in his honour – G is for George and K is for Kingsley – are born of the same barrel-aged sour base beer, with George then fermented with Victorian raspberries, Kingsley with sour Morello cherries. The former, while sharing common ground with Miss Pinky, also sits a fair way from that core range Berliner Weisse within the beer sphere. Everything is more intense, from the deeper pink hue to the jus-like concentration of the fruit aroma and the potent souring acidity that delivers one heck of a pucker punch underneath the fruity sweetness, while some haystack funk lurks in the background. As for Kingsley, it pours a borderline lurid scarlet yet delivers an experience that's more streamlined that its brethren. Presumably the innate sourness of the cherries sits nicely with the underlying base beer, thus you have something leaner, more integrated and aligned that gives the palate less of a workout (although Will Ziebell of this parish favoured George). Completing the trilogy is W is for Wildecherry, making its second outing. Again, Morello cherries are in the mix but where they dominate the aroma in Kingsley, here they're part of an ensemble piece in which malt and age are to the fore. It's a blend of 18, 24 and 36-month-old beers that Matt tells us feature a "very untraditional" grain bill including oats, raw wheat, Aussie ale and Belgian dark crystal malts. It pours a deep russet colour, reminiscent of an old leather armchair in a wood-panelled sitting room, which seems rather appropriate as it's a more statesmanlike affair than G and K in which the cherries and a sweet, citric acidity look to made themselves heard through the oak and aged malts.